2,000+ channels in the US, remote with headphone jack, make your choice in control, motion control for games, speedy streaming, 1080p HD support, perfect for HDTVs, 1-2-3 easy set up, with all these and more features, Roku 3 absolutely becomes the superstar in the streaming media player market. This small box makes it easy to watch a lot of awesome movies, funny TV shows by streaming it directly from the Internet. Unfortunately, you may meet problems when you play ISO files by using it. Do you know the Roku 3 supported and unsupported formats? 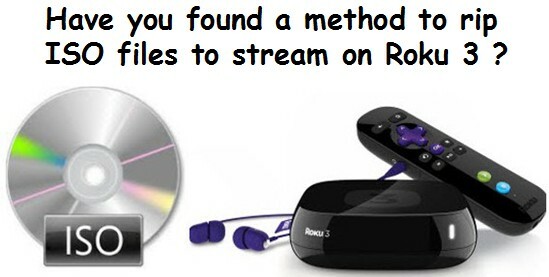 It can be known that Roku 3 supports MP4 (H.264) & MKV (H.264) video, AAC & MP3 audio, JPG & PNG image. Obviously, ISO format is not in the formats list supported by Roku 3. So is there a way to rip ISO files to MP4, MKV format to be readable in Roku 3? Pavtube BDMagic here is sure can offer you what you desire. It is a professional ISO to Roku 3 converter to convert ISO image files to MP4, MKV that Roku 3 supported to stream ISO files on Roku 3 via Plex without limitation. What’s more, it enables you to rip Blu-ray, DVD to Roku series playable formats and output other popular formats like AVI, MOV, M4V, WMV, MPG, 3GP, FLV, F4V, etc. to play in different devices. Another good news you have to know is that this ISO to Roku 3 ripper can support to output H.264 High and H.265/HEVC profile. Tips: If you want to rip other videos from different resource to Roku, for example, rip Youtube videos on Roku, stream iTunes videos via Roku and stream PC videos to Roku, here is your reference. Now let’s download this ISO to Roku 3 converter to play ISO image files on Roku. Please refer to the following steps. Is there a method of ripping the ISO to Roku 3 with better streaming results via Plex? After you download this ripper from ISO to Roku 3, run it and “Load IFO/ISO”or “Load from folder” by clicking the icon on top right corner. As we discussed in the beginning, Roku 3 supported format includes MP4 and MKV. You can click the “Format” bar and choose. MP4 is acceptable by most of the media devices in the market. If you have problems with MKV, here this article can be your reference. Last action, just click the “Convert” button then this ISO to Roku 3 ripper will start to convert your ISO movies to Roku 3 supported MP4 or MKV for you to play on Roku 3 via Plex. After the conversion, go to set up Plex and Roku 3 and lay down on the sofa and play the movie easily by remote with headphone jack, make your choice in control! How to set up Plex for Roku? 1. Download and install Plex Media Server. After installation, create a Plex log in ID. 2. Add media content on your computer to Plex library according to the type of your content (i.e. Movies, TV Shows, Music, Photos, or Home Videos). 3. Plex channel for Roku is now available and you can buy it from Roku store. After making the Plex channel run on your Roku media player, you can watch movies, TV shows, home videos and more you have added to Plex server with Roku player on TV. Yeah, if you have time, go to discover more features of this convenient ISO converter. Enjoy! If you are a Mac user, you can download ISO to Roku 3 converter for Mac, here is the guidance. How do i fix Streaming Media to Roku issues? What Audio and Movie formats are supported on Apple TV ?